Two-point-three litres of British madness. This is what happens when engineers get drunk. Suckers you in with a silky smooth, refined motor. Smashes you in the face with a 200bhp brick when you rev past 10,000rpm. If Ducati made a supermoto, oh wait, they do. V-Twin shove with wide bars and sticky tyres – we’re not sure why they fitted the front wheel. You’ve probably noticed that we’re big fans of the V4 Aprilias. This one is as raw as a naked sports bike gets. What introduction does the ‘Busa need? Sublimely fast, incredibly tunable and king of smokey burnout-launches on a cold tyre. There are bikes that are fast and bikes that are slow, bikes that bore us and bikes we never want to give back the keys for. We’ve had bikes that disappoint and others that surprise the hell out of us. And then there are bikes like these. Bikes that take whatever mood we’re in, throw it away and bring us back cackling wildly. Bikes that always seem to tread on the scary side of fun. Bikes that give us a buzz and leave us laying awake at night wondering how we got away with it. Not just super high-power sports bikes either; it takes different strokes (and bores) for different folks to get a rush. The Triumph brings ridiculous capacity to the party, spinning the earth backward and breaking Physics with every launch. The Hayabusa has been destroying licenses since it burst onto the top speed scene with its Blackbird-devouring handle and mirror shattering aero-styling. The new Hypermotard may be a refined version of the loopy old 1200cc air-cooled model, but that’s like saying Travis Pastrana is a refined version of Evel Kineval – they’re both still way out the end of the crazy scale. The ZX-10R isn’t as out-and-out crazy as a Ducati Panigale, granted, but what the big Ninja has is the whole Jekyll and Hyde thing. At low revs, it’s silky smooth and cruises around as inconspicuously as a bright green bug can. But let it rip round to the other end of the digital rev counter and all hell genuinely breaks loose. It goes from pussycat to prison in about three seconds flat. 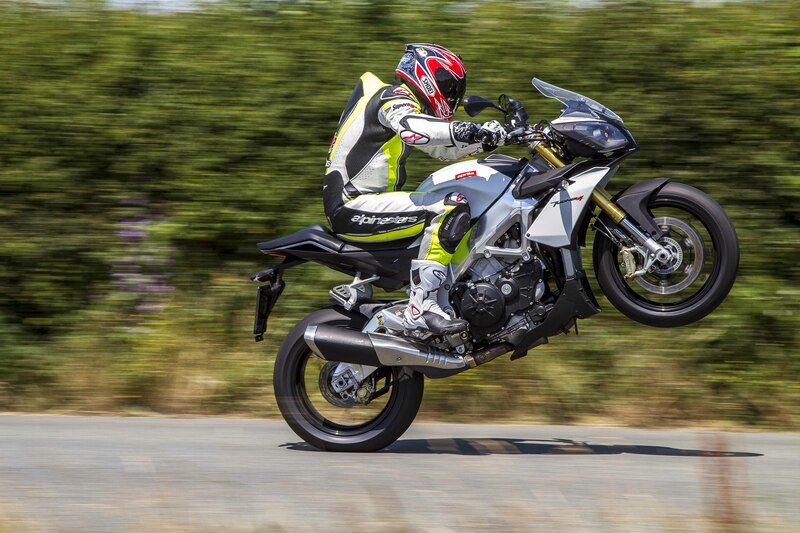 And the Aprilia is a superbike with less bodywork – storming V4 power, a sublime chassis and top spec electronics. The riding position tricks you into thinking you’re behaving, until a three-figure wheelie reminds you to calm down. They’re all nuts. So what to do with five reprobates like this? Well, we stuck ‘em on a track, stuck ‘em into every twisty road we could find and stuck ‘em into our daily lives to see which was best. The winner of this test has got to make every second of riding as loopy as possible, it’s a simple test – the most laughs wins, this is going to be fun. Big power and scrapey cornering are hallmarks of a Rocket Roadster ride out. What were they thinking? How does a conversation that starts “We need to build a cruiser for the American market” end up with a set of handlebars and a seat lashed on to a 2.3-litre inline triple? 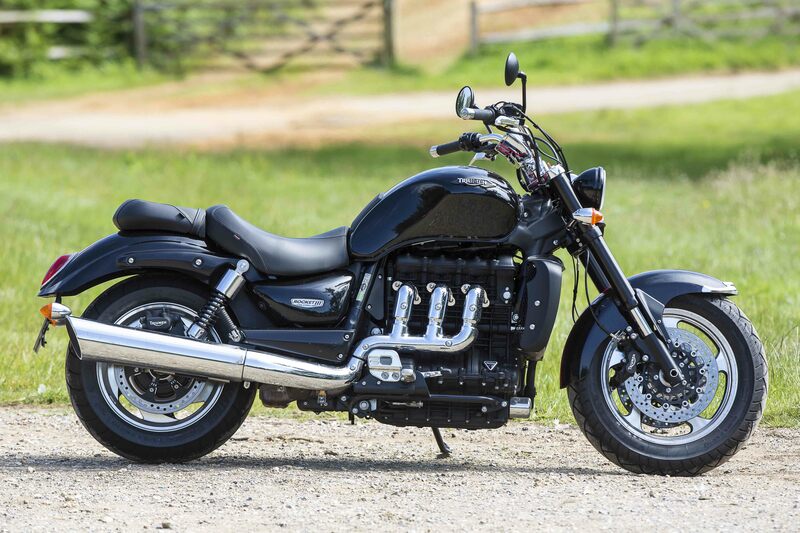 In building the largest capacity production bike, Triumph may not have conquered the US cruiser market, but they sure as hell brought a smile to our faces. This version of the Rocket III is the Roadster – an update brought about to move it more into the muscle bike sector by pulling the riding position back a few inches from the original feet-forward cruiser stance. It still feels like a cruiser to sit on, especially after climbing off the ZX-10R, but it’s not such a stretch to the bars that you have no idea what’s going on at the other end of the forks. It’s my first go on the Rocket; all I have to go on are Alan Dowds’ tales of breaking lights with wheelies and John saying how much shove it has. Yeah, I’m a little apprehensive, especially after going through the specs and spotting the 360-odd kilo wet weight. You end up kinda wrapped around the engine, which only accentuates the ridiculous capacity. Blip the throttle and it rocks to one side, drop the clutch and it rocks your world. You often hear talk of how a bike has immense drive, but I’m going to put it out there and say nothing you can buy from a dealer has shove like this thing. It feels like it’s on the end of a fully stretched bungee rope nailed to the horizon. Every twist of the wrist sends a freight train of torque down through the rear tyre, whisking you forward and rippling the tarmac behind it. The gearshift action is a bit agricultural, but Triumph’s solution to that is 221Nm – yes two-two-one – of torque – there’s rarely much call for a gear change. My only other gripe was the brakes – a couple of times I found myself wanting a bit more stop to match the go – using the rear more than you normally would does help massively though. 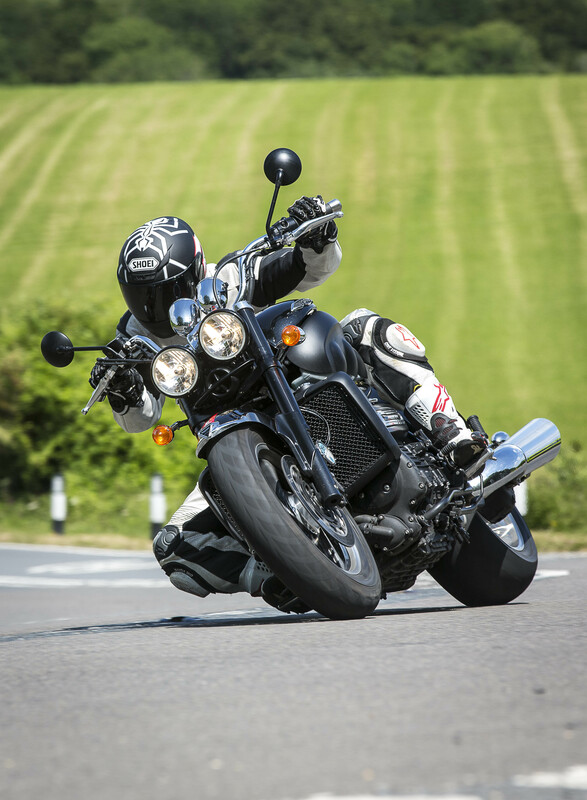 The Triumph’s huge-engine party trick of rocketship acceleration is backed up by comfort that chomps up motorway trips and a chassis that does as good a job of taming all that weight and power as you could hope for. Sure, the first time you pitch into a turn with commitment, the pegs carve ‘Hinckley for life’ in the tarmac, that’s a fact of this style of bike. But what we love is the way you can charge through a set of bends, inside the limits of ground clearance, without the chassis tying itself in a knot. It’s rock solid on long sweeping bends and a hoot to ride, even if you’re daft enough to take it on track. Massive thanks to Jack Lilley Triumph for lending us the Rocket III for a few days. If you’re in the West London area, drop in and see the dealership – shiny bikes, good coffee and a pool table, genius! The Tuono V4R is a proper superbike. With wide bars. And no fairing. Wow, what can we say about this bike that we haven’t said a thousand times, wide eyed and excited already? The V4 Aprilias are the best thing that’s happened to motorcycling since someone at Ducati got on the phone to Massimo Tamburini and asked him to scribble a couple of V-Twin sports bikes with exhausts under the rear seat. While Honda has been mumbling about maybe bringing out another V4 superbike for years, the Eyeties just got on and did it. The RSV4 won World Championships soon after it came out and the Tuono won us over the first time we fired one up. Again, as with the ZX-10R compared to a Panigale, the Tuono isn’t the loopiest of the naked sports bike. Between the Ducati 1098 Streetfighter and KTM’s 1290 Super Duke there are definitely ways to scare yourself faster. But neither of those two does the exotic naked sports bike thing quite as well as the Aprilia. And, despite the KTM’s brutal engine, the Aprilia does everything else with a little more sass. First up there’s the motor. A compact, 1000cc V4 that has the most solid spread of power you’ll find on 17” wheels. Yes the V-Twins have more punch, but through a set of bends, the V4 requires less flapping of the left foot, leaving you to concentrate on grinding your Wiz’s into the asphalt. And as you let the motor sing out to the redline, it absolutely flies, happily chomping gear after gear with no let up in the acceleration. Apart from the sound, though, the motor alone isn’t enough to get the Aprilia under our skin, believe it or not. It’s the complete package. The chassis, with its mix of raw finished castings and polished spars is little short of sublime. It steers quickly, feels nimble and easy to put where you want it but doesn’t feel nervous when the conditions are sketchy. When you start to get a little crazy, there’s enough movement to make things exciting, with the odd kick of the bars over crests, but never to a degree that’s off-putting. And this latest version has a bigger fuel tank, a road-friendly suspension setup and further improved ABS and TC (it was already the best anyway, but whatever). None of that really does riding the Aprilia justice. Let me set a scene so you can see why we love it. I squeak my way across to the garage, open the door and roll the Tuono out into the early morning sunlight. It’s light and small, taking the edge off the usual fight to squeeze past the other vehicles that clutter Northover towers. Bending down to check the oil, I’m distracted by the stunning welding on the main frame and get caught up in the fight for space as a GP-derived chassis clings tightly to the cylinder heads. Hit the starter and the Aprilia barks into life, emitting a sound dominated by a raw exhaust note. Just before I ride off, I glance down at a sticker that reads ’51 World Championships’, then belt-feed the quickshifter gear after gear until I’m gone. There – that’s how evocative this bike is, it’s turned me into some kind of wanna be poet. I’m off to do some swearing now before I start wearing pointy shoes and growing an ironic ‘tache.